Looking for the perfect summer night recipe that can be ready quick? 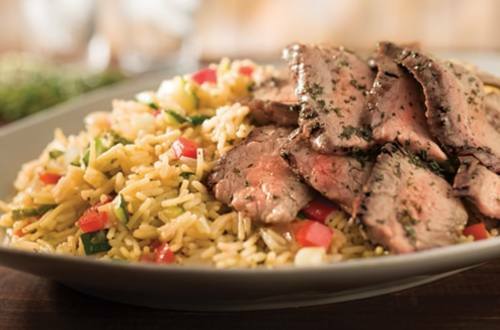 Serve up this savory and satisfying combination of perfectly grilled juicy steak mixed with flavorful rice and fresh seasonal vegetables. 1 Blend 1 Tbsp. oil with herbs in small bowl. Brush steak with herb mixture. Grill or broil steak, turning once, until steak is desired doneness. Let steak stand 10 minutes before slicing. 2 Heat remaining 1 Tbsp. oil in large skillet and cook vegetables until crisp tender, about 4 minutes. Add 2 cups water to vegetables in skillet along with Knorr® Rice Sides™ - Cheddar Broccoli. Bring to a boil; stir. Reduce heat and simmer, covered, 7 minutes or until rice is tender. 3 Serve steak over vegetables and Knorr® Rice Sides™ - Cheddar Broccoli.